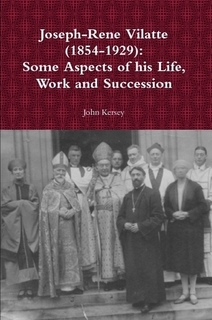 This work attempts to provide a compact and accessible scholarly re-evaluation of the life and work of Joseph-René Vilatte (Mar Timotheos), a towering figure in the Free Catholic movement. The present work attempts to provide a general biographical study of Vilatte and then to discuss some particular aspects of his succession, including the posthumous attacks on him. It offers answers to the reader who is perhaps curious as to why an intelligent and well-intentioned clergyman whose work brought comfort and hope to several hundred folk at the least has been so extensively vilified by those he once worked alongside. Vilatte was a pioneer in the work of church-planting for immigrant and other settler communities in the United States and beyond, seeing in his adherence to the Old Catholic faith a means of ministering to those who found the Protestant nature of the available alternatives unpalatable and the Roman Catholic Church unwilling to see their community worship in a manner indigenous to its traditions (particularly through the use of its native language). Like the missionary bishops of the early church, he established parishes for the communities he served, setting up church buildings and providing valid sacraments through the priests he ordained and appointed. Those parishes, as might be expected, waxed and waned in the complex and often hostile conditions of the time; not least among the hostile parties were the Anglicans and Roman Catholics. But nevertheless, some survived to develop into church movements that survive and thrive to this day, and in the case of the African Orthodox Church, that played a key role in the development of religion among America’s black communities. Published in a softcover edition by European-American University Press. 354 pages.